Waves of carnivorous starfish are eating their way through Australia’s Great Barrier Reef – and sugar cane farming is being blamed. Researchers at Australia’s Institute of Marine Science (AIMS), just outside Townsville, Queensland, in north-east Australia, have mapped the pattern of destruction. “Coral cover is half of what it was 27 years ago, coral cover is going down at an alarming rate.” Dr Katharina Fabricius, coral reef ecologist and AIMS principal research scientist, told the BBC World Service programme Discovery. She said the biggest culprit was the Crown of Thorns Starfish (COTs). Bleaching occurs when corals are stressed by changes in conditions such as temperature, light, or nutrients. They expel the symbiotic algae living in their tissues, causing them to turn completely white. Australian scientists are now looking at ways to reduce the destruction wreaked by starfish, which have the ability to smother coral and digest the fleshy parts. “Crown of thorns are amazing creatures, they can grow to larger than a dinner plate they have multiple arms they’re covered in spines,” said Craig Humphrey, manager of the AIMS SEASIM project, the world’s largest marine environment simulator. 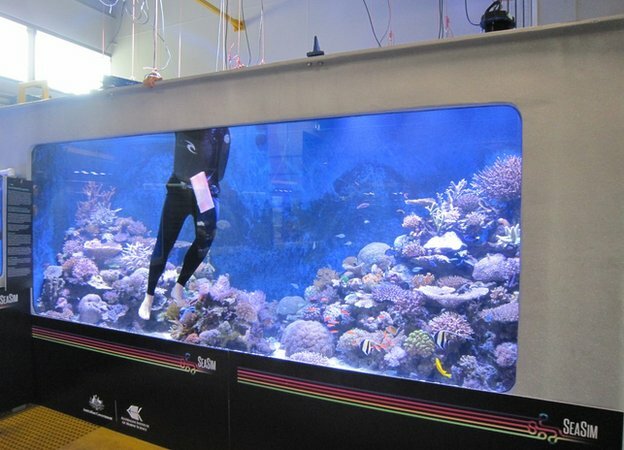 “They go onto a coral, invert their stomach and dissolve and digest the coral tissue.” The SEASIM team is running a series of experiments on COTs to look at ways of lessening their impact on coral. Fertiliser nutrients. There have always been COTs outbreaks: go into the fossil record and you can find the spines of COTs throughout geological history. But while outbreaks have occurred over many years, they now seem to be increasingly in frequency – and nutrients from land-based agriculture are the probable culprit. “The conjecture is the agricultural practice has reduced the time between COT outbreaks,” said Mr Humphrey. “At a point north of Townsville, you’ll get an initial outbreak then you’ll see waves of COTs spreading down the reef, and they’ll consume massive amounts of coral – they do massive damage. 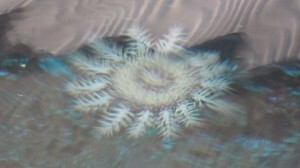 “We’ve held COTs here on restrictive diets, but you put them into a tank with coral and within 12 hours they’ll have consumed all the tissue on that coral.” Excess fertiliser from agriculture, in Queensland particularly from sugar cane farming, is leached into rivers which then run into the sea, taking these concentrated nutrients to the reef. The Great Barrier Reef (GBR) is on a continental shelf, which contributes to the problem, acting as a barrier to the further dispersal of nutrients from the land. “The GBR is having a higher nutrient status because of what’s coming down the rivers – and the main cause of the runoff is agriculture, contributing nutrients to the system at rates that are probably six to 10 times higher than in pre-industrial times,” said Dr Fabricius. John Brodie is team leader of the Catchment to Reef Processes Research Group at James Cook University. He explains that historically only a tiny proportion of COT larvae survived to adulthood – but the agricultural nutrients are changing that. “Crown of Thorns are very fecund animals: each female can produce between five and 20 million eggs per animal – so a lot of eggs. “The larvae drift in the water for about five weeks and eat phytoplankton.” In just the same way that algal blooms have been created in other parts of the world, in Queensland an increase in the amount of agricultural nutrients in the seawater has led to a vast increase in the amount of phytoplankton – which the COT larvae need to survive. As Mr Brodie explains: “What have we done, we’ve pumped a whole lot of nutrients in, we’ve increased the amount of phytoplankton enormously at just the right time of year, so instead of 0.0001% of the larvae surviving, now 10 times as much survives. “Usually we have tiny number of larvae surviving, now we’ve got big numbers – 10 million eggs per female – so each reef might have a million animals, so now you’re talking about five trillion in the water at a time, the numbers are extraordinary.” Mr Brodie has been working with Queensland’s sugar cane farmers to try and reduce the amount of fertiliser entering the sea. He seems to be having some success, reducing levels by 2-3% by suggesting to them that using less fertiliser will save them money and help protect the recreational fisheries that they use.